We love destinations that offer a mix of outdoor activities, history and, of course, creature comforts, and I'd say our recent visit to Ohio's Mohican State Park Lodge fit that description pretty perfectly. The lodge and state park, tucked in Ashland County, in the north eastern quadrant of the state near towns like Loudonville and Mansfield, is in a river valley area offering plenty of farmland and forest in the way of scenery. 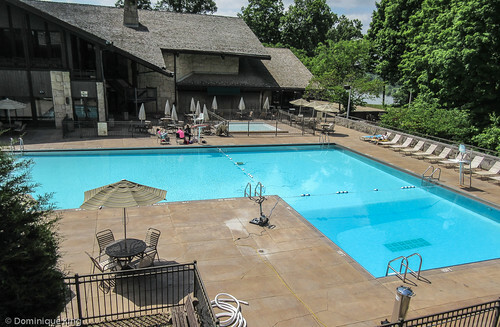 Surrounded by 6,000 acres of Mohican State Park, state forest land and Pleasant Hill Lake, visiting the lodge gives visitors the serene feeling of being far from the crowds and noise of the city and plenty of on-site amenities and nearby places to enjoy nature and outdoor activities. Built in 1974, details like rough-hewn timbers and fieldstone walls give the lodge its rustic feel while large windows throughout the building in its spacious rooms and common areas give visitors a glimpse of the lodge's beautiful grounds before they head back outdoors to check out year-round on-site and in-the-park activities like swimming in the outdoor pool, hiking, biking, horseback riding, snowmobile riding, tennis, canoeing, kayaking, shuffle boards, basketball courts or simply relaxing on the large patio overlooking the lake. 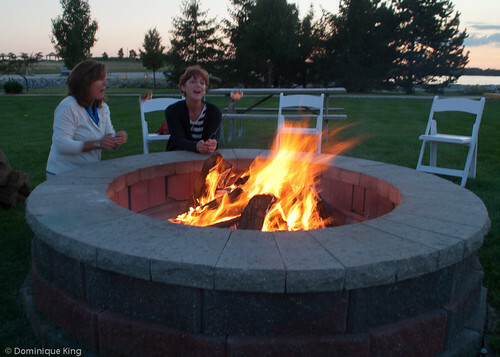 Lodge staffers light a pit fire on the patio during summer evenings, and visitors can enjoy s'mores, which seems to be one of the hallmark activities at the Ohio State Park Lodges (I had some when I visited the state's Maumee Bay State Lodge a few years ago!). Other lodge amenities include an indoor pool, guest laundry facilities, a gift shop, game room and fitness center. We visited with a group of online journalists and their families. The children in our group ranged from kindergarten age through mid-teens, and it was nice to see the lodge set up some special programs that included a pool party and a visit from the park naturalist that proved interesting to the both the kids and the adults in our party. The Lodge also emphasizes their commitment to the facility's accessibility, and I spotted a few images on its Web site of visitors in wheelchairs enjoying the patio and traversing the hiking trails around the grounds. We decided to check out the geocaching scene at Mohican as a way to explore the area upon our arrival at the lodge and to log another find for ourselves after a long lay-off from the sport. I picked up a printed list of over a dozen geocaches in the Mohican State Forest area from the main desk in the lobby. The list proved to be helpful as we weren't always getting a sufficient signal away from the lodge (which had a good, strong WiFi signal) to log into the listings with our cell phones in the field. We did log a nice micro cache find, so we knew we hadn't lost our treasure hunting skills! The lodge has 96 recently renovated rooms with private balconies or patios overlooking the pool or a wooded view of the grounds. Pet owners who want to bring their dog or cat with them to the lodge will find a limited number of pet-friendly rooms. Service animals, of course, are welcome per ADA regulations. 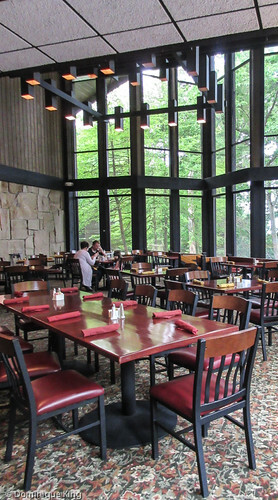 I've attended writing conferences at Ohio's Maumee Bay and Punderson State Park Lodges in the past, so I checked out a bit of Mohican's 5,000 square feet of meeting space. Mohican, like Ohio's other state lodges has a number of meeting rooms and more small and private areas or hallways suitable for small break-out sessions or after-session conversations. I liked Mohican's main lobby, with its over-stuffed comfy leather chairs and a showcase of nature specimens common to the area. We also enjoyed several meals in Bromfield's Dining Room at the lodge. 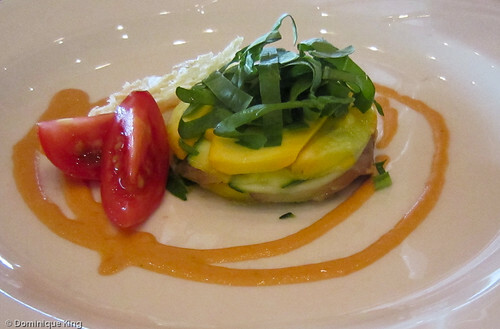 The restaurant, named for Pulitzer-prize winning author and naturalist Louis Bromfield who lived at nearby Malabar Farm, has a menu that reflects the author's world travels and stresses the use of local ingredients. 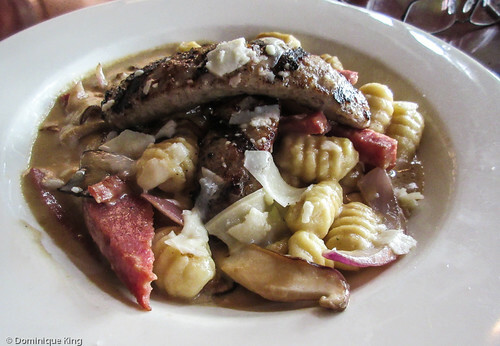 I'm not a big pork eater, but I found the description of Lombardy Gnocchi tempting and had the dish, which featured local Italian pork sausage, Genoa salami, gnocchi, creamy wild mushroom sauce and topped with cheese accompanied by a cup of cauliflower bisque. And, of course the good folks at Mohican had Yuengling beer on draft on the menu! Bring an especially hearty appetite to the restaurant at breakfast, where the servings are massive and enough that several of the kids in our party shared breakfasts between themselves. I ordered the Apple Cranberry Oatmeal with a side order of fruit one morning, thinking it might be a little smaller than choices like Tim's Appleseed Breakfast that included three eggs, two pancakes, hash browns and baked apples, but we both ended up with meals that provided more than enough food and fuel to last through an entire day of activity and exploration. 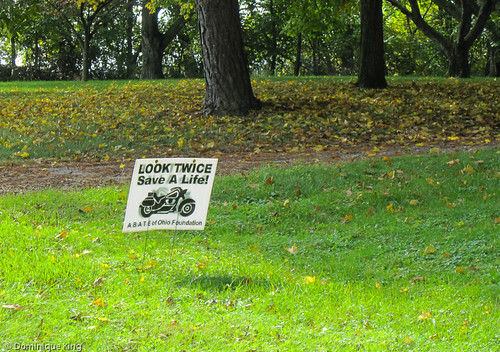 Check back here in coming weeks for more stories about our Mohican-area adventures. 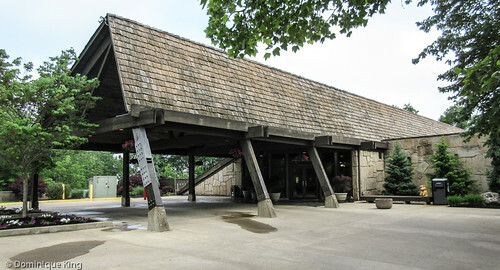 Meanwhile, you can connect with Mohican State Park Lodge on the Web site, Facebook or Twitter. A Galena Getaway-Visiting Galena, Illinois has been on my Midwest bucket list ever since I first read about the town with its quaint bed-and-breakfast inns, shops and historic buildings many years ago. Rosalind's story at Farsighted Fly Girl about a recent visit to President Grant's hometown to celebrate her anniversary reminded me why I've always wanted to see it for myself. Haunted DeSoto House Hotel, Galena IL-Connie also visited Galena recently and shared her experience at the supposedly spooky DeSoto House Hotel there on her Midwest Wanderer blog. Visiting Kaskaskia Island: Illinois' Island that can only be reached from Missouri-Kaskaskia was once the capitol of the Illinois Territory, but the island only appeared around 1881 when the Mississippi River carved a piece of Kaskaskia off from the mainland to create an island. Becky gives readers a glimpse of this unique southern Illinois community at the Family Rambling blog. Surprises you'll find while looking for Lincoln-Sheila takes readers of the Perceptive Travel blog to Springfield, Illinois, home to the Abraham Lincoln Presidential Library and Museum and where our 16th president spent many years of the early years of his marriage and political career. 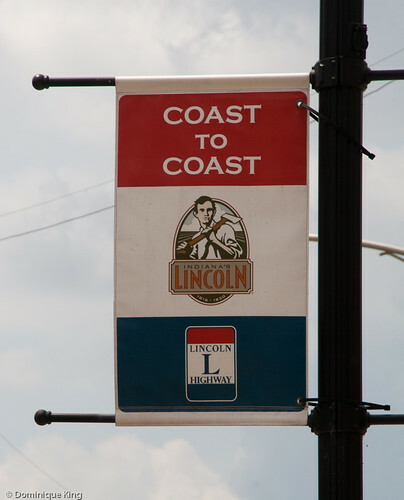 Lincoln Highway Dedicated 100 years ago tonight!-The history of the Lincoln Highway fascinates me, and I liked this account of the decision to officially dedicate the country's first trans-continental highway on Halloween. Check it out at Lincoln Highway News. Spooky Geocaching in Hendricks County- Cemetery geocaches are among our favorite caches to seek because of the interesting local history we often learn during the search. Amanda shares a listing of caches in cemeteries and other reportedly haunted places on Indiana's Hendricks County All Access blog. Board a Tram and Travel Past Stones, Lions and a Mermaid at Cincinnati's Spring Grove Cemetery-Betsy takes readers on a grand tour of a Cincinnati, Ohio cemetery with many sculptures and other artwork memorializing the Ohio city's leading citizens throughout the years at the beesfirstappearance blog. This cemetery reminds me a bit of Cleveland, Ohio's Lake View Cemetery with its great headstones and statues. 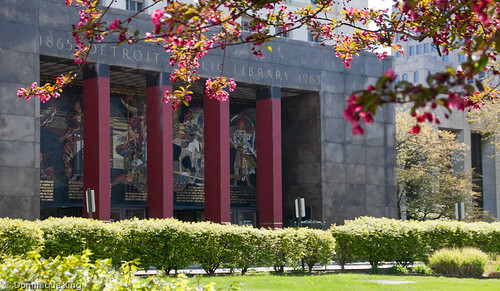 Friday Favorites: "Hidden Gems"-Lisa likens Indiana's State Library building to "an ornate treasure box" full of beautiful craftsmanship, art, history and literature. The photos of the older section of the building completed and dedicated in late 1934 belie its Depression-era origins and remind me of older Beaux Arts-style buildings of the early 20th century with just a touch of Art Deco style. Check it out at the Historic Indianapolis blog. 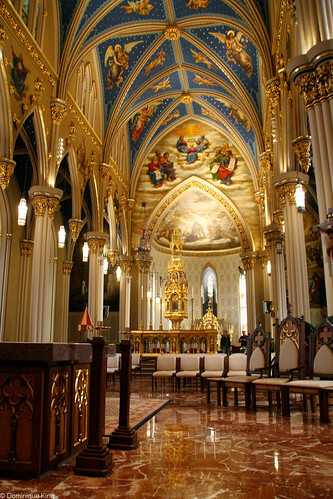 Statues, Sand and Studebakers: Eight of the Coolest Places in Indiana-Scott's list of must-sees in Indiana includes a few I've visited, like the Basilica of the Sacred Heart at South Bend and the collection of life-sized and life-like statues in Carmel. He also takes readers to a few more sites that I'd love to see, like Michael Jackson's birthplace in Gary and the Studebaker National Museum in South Bend. Check the list out at the Quirky Travel Guy blog. Native American Art in Owen Park-You often find art in the most unlikely places, and Charlie discovers an interesting and intriguing gem of Native-style art in a little known park on Detroit's riverfront. Charlie tells this story at his Bikes, Books & A Little Music blog. Review: Cleveland Botanical Gardens with Kids-We've parked in the Cleveland Botanical Gardens parking garage when visiting the nearby Cleveland Museum of Art, but we've yet to visit the gardens. I appreciated Justin's tour of the botanical gardens at his InACents blog. Underground Railroad becomes reality in Lewis, Iowa-I was surprised to learn that there were several Underground Railroad stops in Iowa and Nebraska. Read Lisa and Tim's story on The Walking Tourists blog about the Hitchcock House in Lewis, Iowa where Congregationalist pastor George Hitchcock lived for a dozen years and helped runaway slaves on their journey to freedom. Come along as we visit Elmore, Ohio to see if we can scare up a ghostly motorcycle rider and to check out this cute town near Toledo. This ghost story always fascinated me, so Tim and I recently visited Elmore to do a little ghost hunting, find a geocache and to find out more about the town and what to do there. Check out my story, The Tale of the Elmore Rider, at the Ohio Tourism Division's Discovering Ohio blog. Want to learn more about Elmore? Check out Elmore and Genoa (Images of America) by Jennifer Fording. Check out the Crisp Point Lighthouse-Jesse visits one of Michigan's most remote lighthouses in the state's Upper Peninsula. This one is still on my bucket list of Great Lakes lights I need to see, but I'm glad to get a glimpse of it at Jesse's Things to do the in U.P. blog. A Walk Around the Mission Point Lighthouse-We've visited this lighthouse at the tip of the Old Mission Peninsula, and at the 45th parallel, many times. 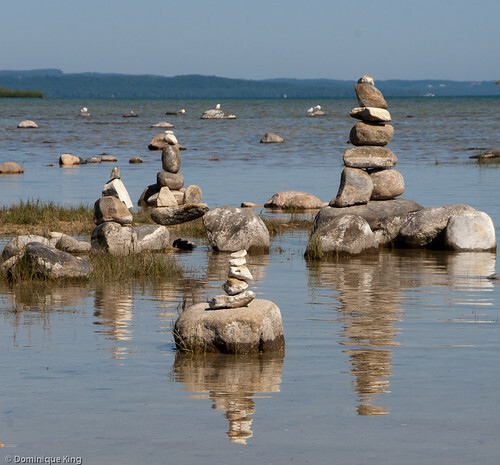 It's a special favorite of mine because of the balanced rock sculptures that always seem to dot the Lake Michigan shore there, so it was fun to take another virtual visit there with Mike at the Loving Traverse City blog. Bicycling in western Michigan-Michigan has more than 2,600 miles of rail trails, more than any other state. That makes it easy to tour the western side of the state via bicycle along the Lake Michigan shoreline. 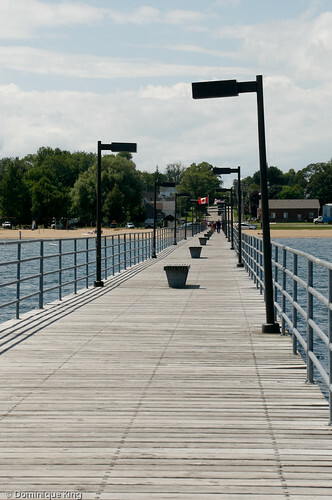 Check out the routes running from Traverse City to South Haven at the Midwest Weekends blog. Family vacation fun with city bike tours-Jamie and her family check out Chicago via bicycle at the Travel Savvy Mom blog. Sounds like a great way to cover a lot of ground in one afternoon to see some of the city's most iconic sites. 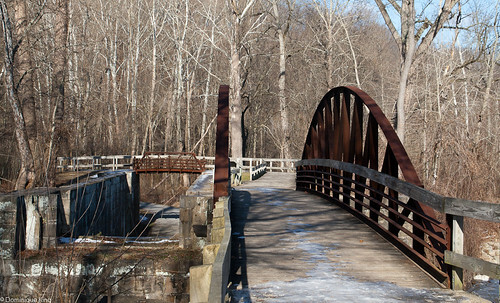 25 Great Ohio Hiking Spots-If you want to explore Ohio by foot, Mike has 25 suggestions for walking and hiking routes in the Buckeye state at his OHventures blog. We've walked a bit of the trails in the Cuyahoga Valley National Park and in Hocking Hills State Park, but there are plenty more great trails on this annotated list that details attractions, accessibility and other information about each trail. Wayne County Adventures in Geocachng-Geocaching is another great way to get outside and explore. We like picking geocaches to search out with the idea of learning a bit of history about a destination or enjoying a walk through nature. Join Angel at the Indiana Insider blog as she explores history in the Richmond, Indiana area, starting with a cache at the Welcome Center for America's first interstate highway. 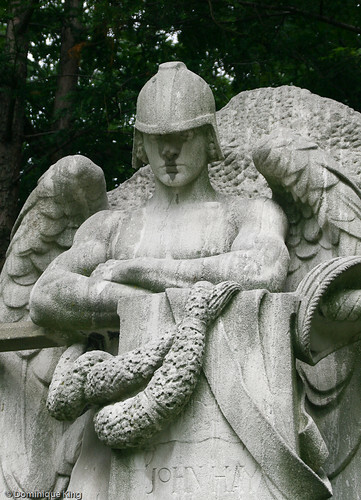 Visiting the Lake View Cemetery in Cleveland, Ohio-I wondered about a suggestion that I should visit this cemetery when I visited Cleveland several years ago, but I found the history, architecture, art and landscaping there pretty fascinating. When Tonya asked me to suggest a "historic home" to visit in Cleveland, I passed the idea on to her, and it looks like she and her family found it every bit as fascinating as we did! Check out her take on it at the Traveling Mom blog. Finding President Garfield and Rockefeller graves at Cleveland's Lake View Cemetery-It looks like Tonya and I are not the only ones who found Lake View fascinating. Check out the story of Scott's visit there at the Quirky Travel Guy blog. Take a 60-minute walk around the State at the Ohio Governor's Residence and Heritage Garden-Betsy helps readers cover a lot of ground with a 60-minute walk at the Governor's residence in Columbus, Ohio. 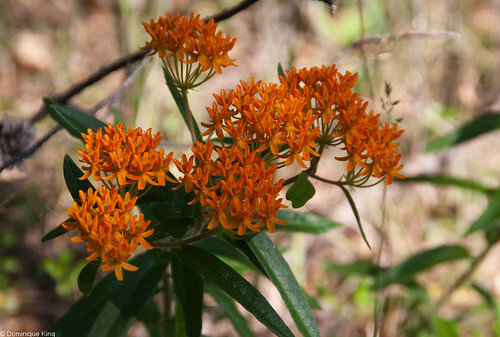 Check the beesfirstappearance blog and let her show you plants from around the state at the mansion's Heritage Garden. Happy flag day: Here's the history, briefly, of Detroit's flag-I've featured stories about Chicago's city flag and the city flag for Cincinnati in these monthly Midwest link collections, so I was especially pleased to see Amy's story about Detroit's city flag at The Night Train. Although Amy characterizes Detroit's seal, which centers the flag as the "saddest city seal ever", it still tells a fascinating story. The "Fort" of Fort Wayne-Like many Detroit-area residents, I'm familiar with Fort Wayne...in Detroit. I enjoyed Michelle's story about the replica fort in Fort Wayne, Indiana at the Fort Wayne Insider blog. I wasn't familiar with this particular Fort Wayne, so now I have something else to add to my itinerary the next time I visit that northern Indiana city. I originally visited Maumee Bay State Park Lodge a few years ago with a writers retreat group during a quiet weekend in early April and found it well-suited as host to a series of classes, breakout sessions and just slipping away to a cozy corner somewhere to write. So what was it like when I recently revisited the state park resort near Toledo, Ohio during the height of a busy summer season? I loved the opportunity to enjoy more of the lodge's recreational facilities and see how the experience differed from that quiet writers retreat. This time, the weather was mostly clear and sunny. 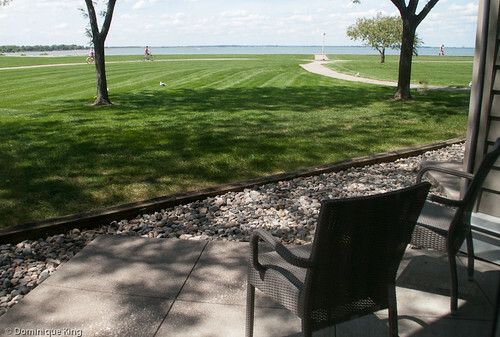 I enjoyed checking out the lodge's outdoor attractions like the 18-hole golf course, marina and Lake Erie beach. Most attractions are a very quick walk from the lodge, although bicycles and golf carts are also popular ways to get around the park. I only had a couple of hours to explore the lodge on my own one afternoon, so I opted for taking one of the lodge's rental bikes for a ride around the park. Geocachers will find lots of treasure to seek at Maumee Bay. I had time to grab one quick cache just off of the trail that circles the lodge during my bicycle ride, but there are more than a half dozen caches hidden inside of the park and others hidden just outside of the park. New to geocaching? 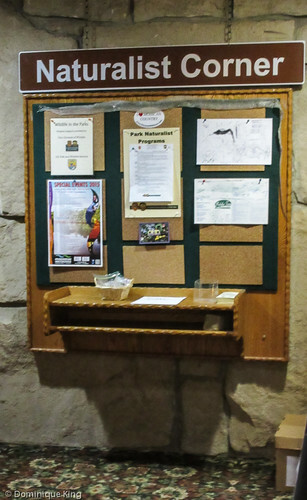 You rent a GPS and pick up some helpful hints for beginning cachers from the lodge's front desk. I remember the food at my writers conference earning raves from everyone, which is difficult to pull off with a group meal that needs to meet a strict budget. 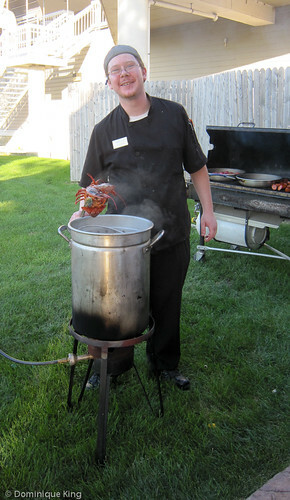 This time, I had a chance to sample the food at Maumee Bay's Water's Edge Restaurant and during a lakeside clam bake. Chef Monica Jazwiecki served up imaginative dishes like a truly beautiful layered summer vegetable salad of locally grown zucchini, summer squash, baby eggplant and red onions with a parmesan crisp and dressed with tarragon vinaigrette, baby spinach, local heirloom tomatoes, roasted tomato dressing. Desserts like the grilled peaches and lemon basil ice cream with a pine nut crisp I had at the end of one dinner offered further evidence of her use of a wide range of flavors in unexpectedly great combinations. Jazwiecki and her crew served up a classic meal for our clam bake that featured her seafood bisque, clams, sweet local corn on the cob, roasted potatoes and a whole steamed lobster (which was a great surprise treat for this lobster fan!). I especially enjoyed watching the summer sun set from the lodge's expansive lawn fronting Lake Erie while our group enjoyed roasting s'mores over an open fire. The lodge remained largely as I remember it from my first visit, but there was one change I particularly appreciated as someone whose work as a travel writer often sees me traveling with a computer or tablet to take notes, do a little research, write or edit photos during my travels. Several years ago, you had to pay an Internet access of nearly $10 a day at the lodge, although I got a few dollars off of that as a conference discount when I was there with my writers group. The resort replaced those fees with a much smaller "tech fee" levied against rooms and cabins to cover costs for things like online access and local phone calls. High charges for online access tacked on top of lodging charges is a personal peeve of many travelers, especially those who travel for business, so I'm glad to see this change at Maumee Bay. This last trip was quick and packed with activity, but it was possible to grab a quiet moment enjoying the view from the patio of my lakeside room. Even as the lodge hummed with activity, the resort's sprawling grounds and spacious facilities meant that you never felt as if it was overcrowded. The lodge rooms were a quiet retreat from the bustle of activity in the lobby, and over two dozen quiet sitting areas scattered through the lodge hallways and conference wing offered plenty of places for a quiet conversation or place to relax with a good book. I look forward to seeing what new discoveries I'll make next time I revisit Maumee Bay. Thanks to Xanterra Parks and Resorts and Maumee Bay State Park Lodge, which provided lodging, meals and on-site activities for my review, with no further compensation. I was free to express my own opinion about my stay and experiences, and the opinions expressed here are mine. We love visiting college campuses for cultural activities, beautiful art, historic buildings and green spaces. 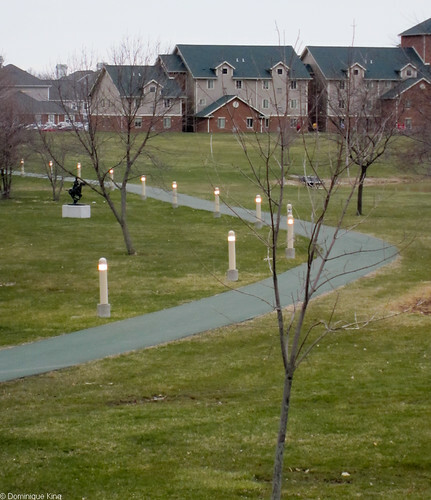 The pretty little campus at Ohio Northern University (ONU) in Ada, Ohio, offers a lot of the amenities and activities you might expect from a larger school, along with a friendly, small-town atmosphere. Henry Solomon Lehr, a Civil War veteran and Ada schoolmaster, jockeyed his schooling around working full time, eventually graduating with a PhD from eastern Ohio's Mount Union College while he worked in Ada. His experiences as a student shaped his belief that colleges should offer schedules and classes that students who needed to work and support themselves could more easily fit into their lives. As Ada's schoolmaster in 1866, Lehr began offering evening "select school" classes for students wanting education beyond the basic school curriculum. The classes were popular and the town supported Lehr's request for money to buy land and construct a building for the "select school", which opened as Northwest Ohio Normal School in 1871. The normal school (or teachers' college) had nearly 150 students and accepted women as students and faculty from the very beginning. 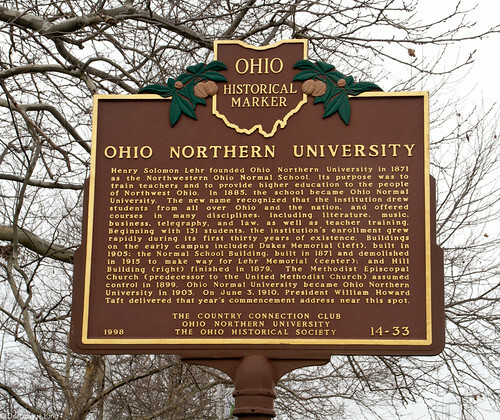 The school grew through the late-nineteenth century, expanding beyond training public school teachers by establishing separate colleges for business, engineering, pharmacy and law during the 1880s and becoming Ohio Normal University in 1885. State funding for the school dried up in 1899. In 1900, Lehr sold the school to the United Methodist Church in order to save it, and the school remains a private, Methodist-affiliated institution today. 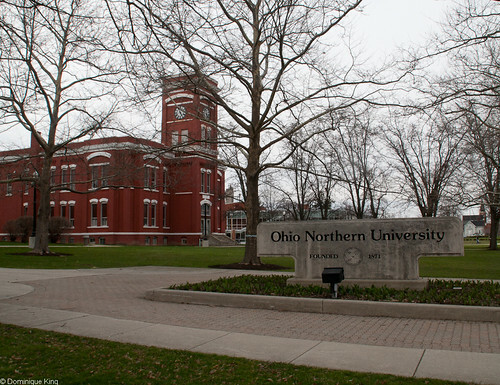 In 1903, the school became Ohio Northern University. School officials expanded the school in the early 1900s, establishing a medical school with the Fort Wayne College of Medicine in Indiana in 1904 and adding an Agricultural College in 1911. By the 1930s, ONU dropped disbanded the medical school, agricultural school and a high school prep program. ONU began growing again after World War II, with recent years bringing some of ONU's biggest developments, like the building and opening of an inn and conference center on campus in 2008. ONU has 20 varsity sports, and its Polar Bears compete in NCAA's Division III. We were particularly impressed with the school's vintage-2004 Dial-Roberson stadium situated on the west campus, an area formerly home to the defunct agricultural school's farm. The fact that ONU retained ownership of the farm after its agricultural program's 1923 dissolution contributes to its spacious feel and room for outdoor facilities like an 18-hole disc golf course (established in 2003) and the school's fabled "Green Monster". The Green Monster began as a 2.5-mile jogging path around the campus in 1991, earning its nickname when physical education students dubbed it "a monster of a walk" during classes. In 2007, donors placed 12 western-themed, cast-bronze statues of works by artists like Frederic Remington, Charles Russell and James Fraser along the path. Ten of the works are Remington reproductions, and many refer to that section of the path as the Remington Walkway. 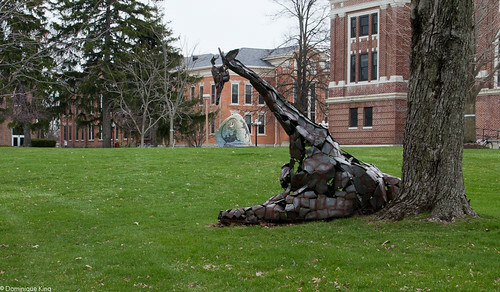 ONU has plenty of other attractions for culture fans with a number of public art pieces on the central campus, the Freed Center for the Performing Arts (featuring an eclectic schedule of music, dance, plays, lectures and other stage shows) and the Elszy Gallery of Art. We spent a lot of our time there wandering campus and taking pictures. We also managed to dodge the raindrops the weekend we visited to find one of several geocaches hidden on campus. Today, ONU has about 3,600 students. 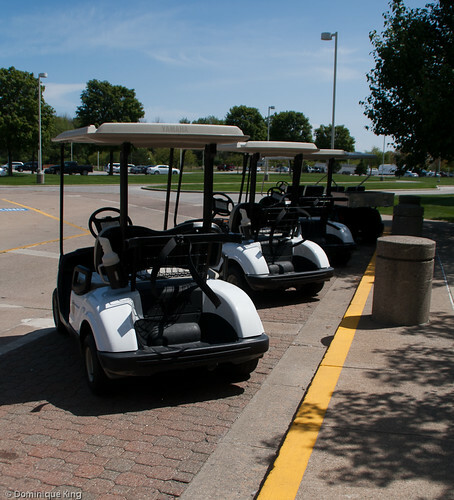 The school offers 70 different majors, and its highly regarded academic programs helped to place it second among 371 Midwest Regional Colleges in U.S. News' "America's Best Colleges 2012" ranking. Check out my story about The "football capital of the world" at Ada, Ohio come back later this week for my review of the Inn at Ohio Northern University. You can also follow ONU on Twitter and Facebook. Want to learn more about the history of Ada? Check out Hardin County (Postcard History) by Ronald I. Marvin Jr. Thanks to Julie Henning for this story about an upcoming geocaching event in Cambridge, Ohio. Take a trip back in time this winter, experiencing old world England in historic downtown Cambridge, Ohio. Created in 2006, Dickens Victorian Village is a public art exhibition on display from early-November through mid-January along Wheeling Avenue in downtown Cambridge. Inspired by the characters and scenes from Charles Dickens’ novels, Dickens Victorian Village features 185 life-like mannequins and 80 scenes this 2011-2012 season. Cambridge is also ground zero for a winter-friendly geocaching event. Partnering with the Cambridge/Guernesy County Visitors & Convention Bureau for the second year in a row, Ohio geocacher David "CatsInTheCradle" Waters just announced the approval of the Cambridge Christmas at Dickens Village II event on Geocaching.com. (GC34JJ3). Waters will place approximately 70 temporary caches on an approximately one mile route along Wheeling Avenue and by the Guernsey County Courthouse for the event scheduled from 3:00 p.m.until 9:30 p.m.on Saturday, November 12, 2011. The event is 100% wheelchair and stroller accessible, participants are encouraged to gather around coffee, hot chocolate, and cookies, geocaching before and after one of four computer-controlled—30,000 lights choreographed and set to music—holiday lights shows at the courthouse. Holding the event twice in 2010, Waters recalls, “We had about 40 at the first event and about 75 at the second one.” Coordinating the event with the help of geocaching friends, last year’s event drew attendees from the Pittsburgh Area Geocaching Association, Ohio Valley Geocaching Association, and The Wilderness Center Geocaching Club. Fundamentally, the event is similar to last year. Dickens Victorian Village is bigger and better, and the city of Cambridge has been undergoing revitalization all summer long. “The Structure of my event has not changed, but Cambridge just had a facelift, so the benches and light posts are new 'antiques' and the vignettes will not all be in the same places they were,” Waters added. In addition to donations from Haberfield and Dickens Victorian Village, Waters hopes to have engraved wooden nickels available to this year’s event participants. Bio: Julie Henning is the Feed Me and Geocaching editor for Road Trips for Families, a site for families who love the open road. An expert in family-friendly Wisconsin, she has written two iPhone apps, Madison Loves Kids and Milwaukee Loves Kids. A member of the Midwest Travel Writers Association, Julie is a regular contributor to her hometown newspaper in Sun Prairie, Wisconsin, where she lives with her husband and three young children. Text © Julie Henning 2011 All rights reserved. Photos courtesy of David Waters and the Cambridge/Guernsey County CVB. Text and photos used with permission. We discovered Port Crescent State Park near Port Austin on Lake Huron at the tip of Michigan's Thumb when we looked for flat-water canoeing in the area. 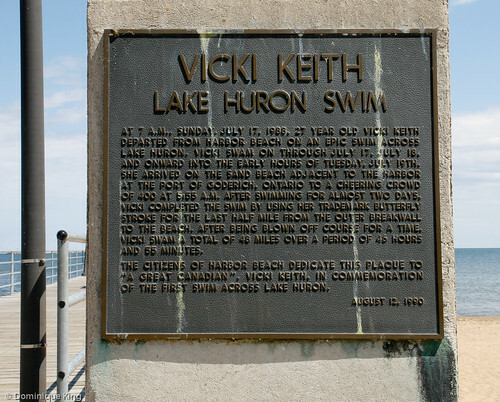 We've visited this park on Lake Huron many times since our trip on the Pinnebog River. 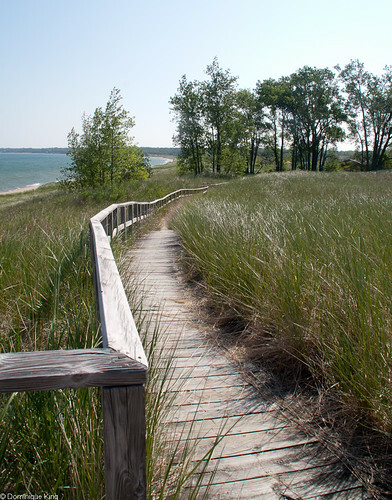 On our most recent trip to the park we walked the Dunes Nature Trail, a three-quarter mile interpretive trail where visitors can learn about sand dune ecology, wildlife, plants and dune forests. 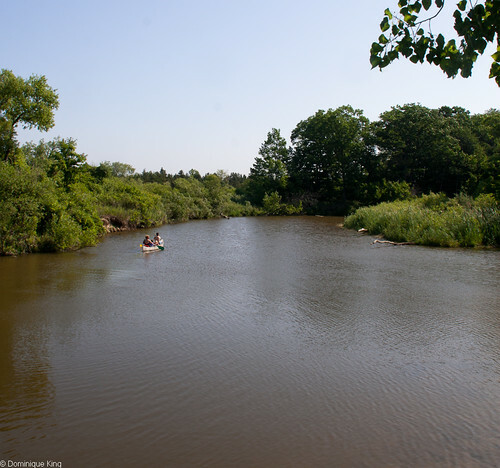 Hikers can access one the park's longer hiking and cross-country ski trails or hop off onto part of the park's 900 feet of beachside boardwalk from the nature trail loop. 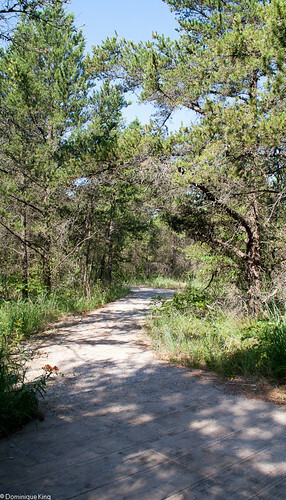 The Dunes Nature Trail, converted from a 1970s-era fitness trail and completed in 2009 with an Access to Recreation Grant, has a flat-limestone aggregate surface and strategically placed benches, making it accessible for physically challenged visitors. Port Crescent State Park, and nearby Albert E. Sleeper State Park near Caseville, are two hours from the Detroit area, making them great for campers looking for a quick weekend trip. 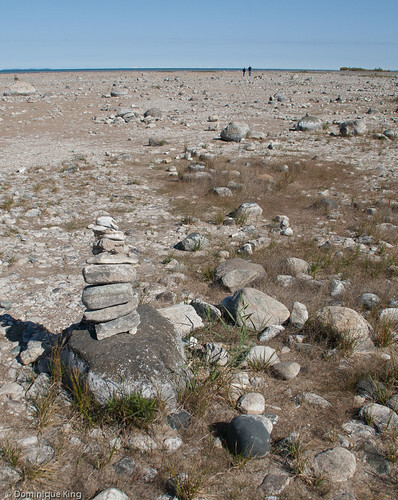 Port Crescent has fewer campsites than Sleeper, but it has a wider variety of day use activities and barrier-free facilities like a recently added 400-square-foot Camper Cabin with a waterfront view and the Dunes trail. 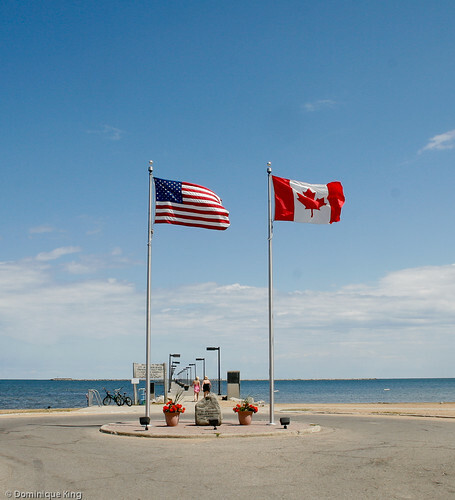 Port Crescent State Park is on three miles of sandy shoreline along the big lake's Saginaw Bay where visitors can enjoy swimming and walking the beach in addition to hiking, fishing, canoeing, cross-country skiing, birding and (in season) hunting. The park sits on the former site of a bustling mid-1800s company town where steam-powered sawmills along the Pinnebog employed hundreds of area residents. Others worked at blockhouses where they extracted brine from evaporated water to produce salt. The town of Port Crescent had a two-story school, Lutheran church, company store, hotel and tavern along its several streets. One sawmill became so busy salvaging thousands of trees felled in one of the infamous fires experienced by the Midwest in 1871 that it added a 120-foot brick chimney to help power the plant. In 1881, another fire swept through the Thumb region, destroying the area's timber resources. The lumber mills closed, as did the firewood-fueled salt plants. Workers dismantled some of the buildings and an 800-foot dock, moving them north to Oscoda, Michigan. Some Port Crescent residents moved their houses to nearby towns. By 1894, all of the buildings in Port Crescent were gone, leaving few traces of the town behind. The State of Michigan purchased the site for the park during the 1950s. Today, you'll find remnants of the brick mill chimney and an old steel bridge in the park. This visit, we drove to the nearby Port Crescent Cemetery to find a geocache. Seeing the town's old burial grounds requires a short walk through the woods (a welcome relief from the record heat while we visited, but a bit mosquito-ridden). The old cemetery had its share of broken headstones, but it seemed reasonably well cared for and gave us a feel for the old ghost town's residents. We found the cache and a few interesting headstones like this one made from bricks used to construct Port Crescent's brick mill chimney. 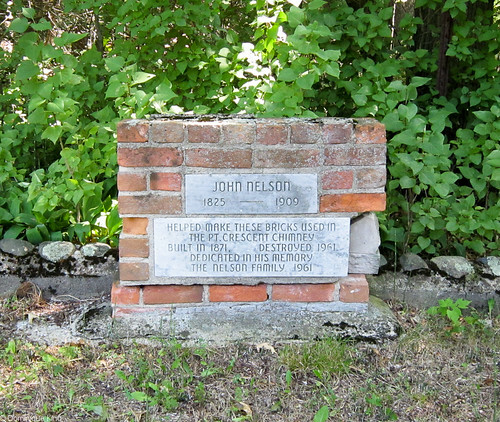 Want to learn more about the history of Port Crescent and other small towns in the area? Check out Huron County Michigan (Images of America) by the Huron County Historical Society.